UConn’s Shabazz Napier of Roxbury, who scored 22 points, lets everyone know who the top dogs are. ARLINGTON, Texas — Connecticut left Kentucky young and done and the Final Four as national champions. 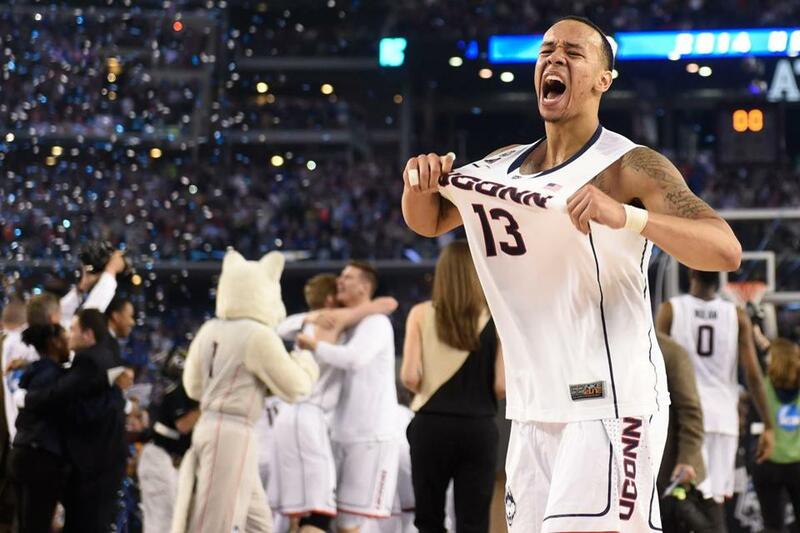 The Huskies might have been underdogs, but now they’re the top dogs in college basketball. It’s not a fluke. This was not a case of Kentucky’s fabulous, and soon to be fabulously wealthy freshmen, not rising to the occasion. It was a case of UConn and its dogged and tenacious defense — an extension of the personality of coach Kevin Ollie — and the best backcourt in America outplaying and outwilling Kentucky for 40 minutes. Don’t fit UConn for glass sneakers after it captured its second national title in four seasons and fourth overall with a 60-54 victory Monday night in the national championship game at AT&T Stadium. The Huskies never trailed, and when the perpetual procrastinator ’Cats tried to stage another of their patented NCAA Tournament comebacks, UConn rebuffed them with clutch shotmaking and pestering defense. UConn entered the tournament as a No. 7 seed, but the Huskies are the undisputed top team in the land. You earn that title when you take down the three most talented teams in the tournament in succession — Michigan State, Florida, and Kentucky. That’s exactly what UConn did behind Ollie, who delivered the school a national title in just his second season after replacing Jim Calhoun. This game was always going to come down to UConn’s smothering defense against Kentucky’s fusillade of freshman firepower. Kenpom.com, which has become the analytical bible of college basketball, listed Kentucky as having the sixth-best adjusted offense in the country and UConn as having the 10th-best adjusted defense. UConn’s defense, quick feet, and iron will won out. The Huskies held Kentucky to 39 percent from the field for the game and 33 percent in the second half (7 for 21). The Huskies forced 13 Kentucky turnovers, leading to 17 points. Ollie’s defensive game plan held putative lottery pick Julius Randle to 10 points and six rebounds. In the year of the one-and-done, it was the backcourt of senior Napier and junior Ryan Boatright that signed their names on the season and denied Coach Cal from winning his second national title in three seasons with a plug-and-play team. Roxbury’s Napier joins Cambridge’s Rumeal Robinson as local boys who made good on college basketball’s biggest stage. Napier scored 22 points in his victory. Robinson had 21 points 25 years ago to lead Michigan to a national title. It was Napier’s second national title as he won a title as a freshman in 2011, bookending his career. Boatright scored 14 points on 5-of-6 shooting and shook off a left ankle injury with nine minutes left to hit a huge step-back jumper over Randle with the shot clock winding down and 4:13 to go, giving UConn a 56-50 lead. There were two worthy teams on the floor playing in front of an NCAA Tournament title game-record 78,238 fans at Jerry Jones’s one shiny monument of excess, but only one champion and one shining moment. There was no more magic left in the shooting hand of guard Aaron Harrison, who hit go-ahead 3-pointers in three straight games that Kentucky won by a combined 9 points. And no matter how talented you are fundamentals matter. The Wildcats shot just 13 of 24 from the line, while UConn was a perfect 10-10. The Huskies were holding on for dear life in the second half. You could feel the agita from Stafford to Stamford in Connecticut. Kentucky pulled within a point twice in the second half. It was 48-47 after a pair of free throws from James Young (team-high 20 points), who had a delivered a vicious posterization of UConn’s Amida Brimah just 2 minutes and 27 seconds earlier, after UConn had gone up 9. The freshmen were climbing the hill of history, but they couldn’t reach the summit of college basketball. After the Kentucky freshmen cut it to 1, Harrison missed a 3-pointer. Then Napier hit a long three. Fellow senior Niels Giffey followed with another three and it was 54-49. This ended up being a nailbiter, but it didn’t look that way early. Coach Cal and Kentucky had to consider themselves very lucky to be down by only 4 points at the half (35-31). UConn was executing its blueprint against Big Blue. Napier and Boatright, who had three steals apiece, harassed the Harrison twins (Aaron and Andrew) like paparazzi stalking a celebrity, not allowing Kentucky to get into its offense. Kentucky turned the ball over seven times in the first half, leading to 11 UConn points. Those who don’t like Calipari would say Kentucky vacated possession of the ball. With 7:15 left in the first half, Kentucky was shooting just 29 percent from the field (5 of 17) and had four turnovers, as many as it had committed in the entirety of its national semifinal victory over Wisconsin. UConn would extend the lead to 15 (30-15). But Kentucky outscored UConn, 16-5, the rest of the way with DeAndre Daniels and Boatright on the bench in foul trouble and Calipari going to a 1-3-1 zone. But a team that was excellent at denying its opponents would not be denied in the second half. UConn is No. 1 and well done.